These are great quick guidelines to think skeptically. Thanks Liminality, as Carl Sagan said: “If we don’t ask skeptical questions, aren’t skeptical of those in authority…then we’re up for grabs”. 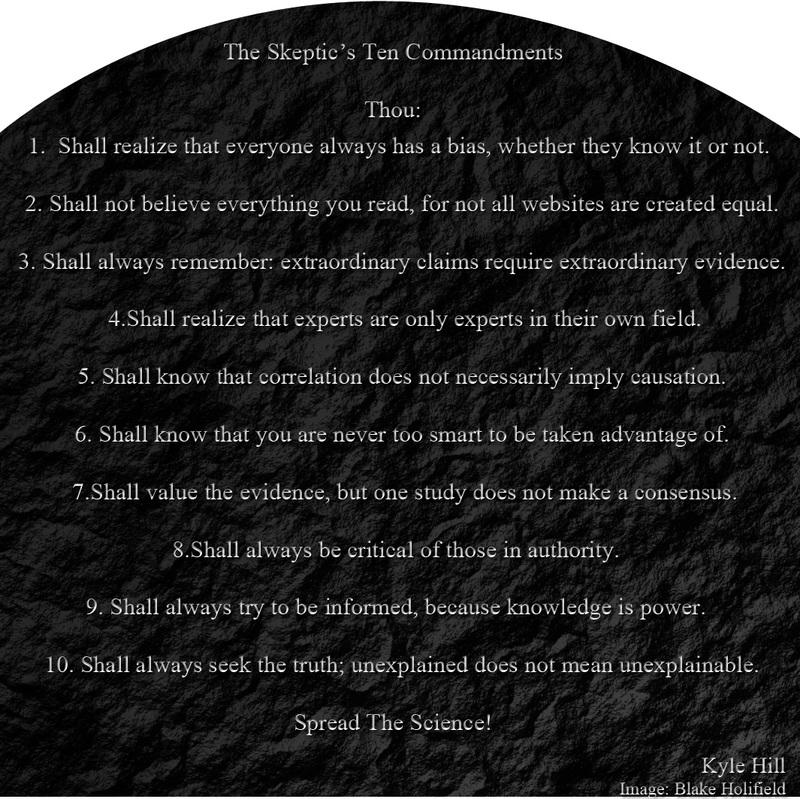 I really like the idea of the Skeptical Ten Commandments. Really well done. first time visitor to your blog, and I’m staying. Thanks Sergio! Glad you enjoy the site. this is great, printing and posting over my desk. email updates, please and thank you. As a Christian, I think these are great. I think it’s a perfectly acceptable approach to Bible Study as well. I’m starting a series called Skeptics Corner on my blog. I think I’ll add this to the preamble if that’s okay with you. My name is Mike, and therefore I practice ‘Mikism’… a system comprised entirely of my own beliefs. I will NEVER allow someone to supplant my beliefs with their own. Those that allow others to dictate a system of beliefs to them are ignorant, weak or lazy. 1) – I will NEVER accept a popular or convenient belief… simply because it is popular or convenient. 2) – I will carefully weigh the validity of every supposition, fact or explanation presented to me. 3) – I will ALWAYS recognize and respect the vast chasm between theorem and proof. 4) – All of human history teaches us that ‘unknown’ does NOT mean ‘unknowable’. 5) – If not for those who question the status quo, people would still be huddling in caves worshipping rocks, trees and weather. 6) – The fact that I, as a thinking being, can cause or alter events… is NOT proof that all events are therefore caused by thinking beings. 7) – Attribution of the unknown to deities or supernatural events… is the definition of laziness. 8) – I will always seek logical and provable answers to life’s questions. 9) – I fully accept that many of my questions will not be answered in my lifetime. 10) – I shall die knowing that my time and intellect were not wasted on the primitive worship of natural phenomena.